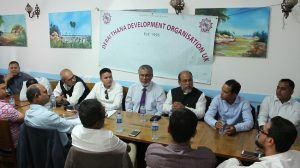 Dirai Thana Development Organisation UK’s first Executive Committee meeting was held on 19th June at a restaurant in Whitechapel. Members across the UK took part in the meeting where the committee took some executive decisions which included creating a website for the organisation, UK charity registration, reorganise Whatsapp Group and organising an Eid reunion. The committee also announced a five members committee to organise an inauguration and Eid reunion. President of the organisaiton Milik Miah Chowdhury presided over the meeting and General Secretary Biplob Sardar conducted it. Guests who addressed the audience included Vice-president Abdul Kadir, Assitant General Secretary Syed Ziaur Rahman, Organising Secretary Foysol Mianh, Education Secretary Dr Shihab Miah, Cultural Secretary Akhtar Hossain Chowdhury, Press and Publicity Secretary Mohammod Lechu Miah, Executive Members Md Jahan Miah, Professor Mahbub Hossain, Firojul Haque Firuj, Islam Uddin, Barrister Fakhrul Alam Chowdhury, Advocate Abul Hasanat, Shafiqul Islam, Faruq Miah Chowdhury, Sijil Miah, Md Tipu Miah Chowdhury and others.